InterContinental's Grand Kitchen is One Year Old! 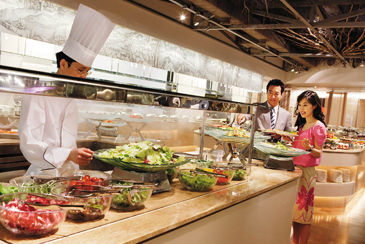 The Grand Kitchen has earned a reputation for the excellence of its buffet selections in the brief one year period it has been open. In celebration of this anniversary, we're featuring beginning on April 3 on a weekly rotating basis for the next five weeks the cuisines of Hungary, Greece, Caribbean, Scandinavia, and Mexico in a special corner. In addition, for lady groups of six or more, we're offering the free use of our karaoke room until 6:00 p.m.
Why not try something new and different such as mushroom soup with sour cream? Or stop by the kebab station during Hungary week? If you prefer traditional Greek food, how about spanakopita (Spinach and feta cheese turnovers in phyllo dough) or dolmathes (tender grape leaves stuffed with savory rice)? Then, there's a wild assortment of salads such as mngo and ppaya salad with orange chili paste or a main dish of grilled tuna steak with ponzu sauce—both inspired by the tastes of the Caribbean. For Mexican food lovers there's tortilla chips with fresh salsa and guacamole (at the table) and vegetable quesadillas and tex-mex chili—just to name a few of the dishes. Finally, if you don't mind waiting you can enjoy Scandinavian delights such as hot smoked salmon fillet with souted dill chive sauce and boiled apple ham with hot apple mint sauce.